Wild West Cowboy Birthday Party! Saddle up, because this boy’s cowboy birthday party theme takes guests on a fanciful journey into the Wild West. 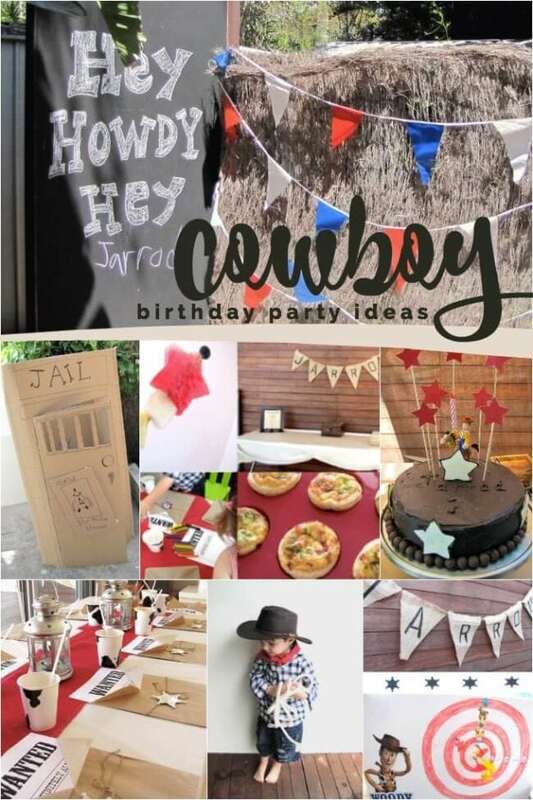 Created by Natasha of Mini Mocha for her son, the cowboy birthday theme comes to life with party supplies like cowhide cups, tin lanterns, and sheriffs’ badges. Natasha’s DIY party decorations add so much excitement to the event. 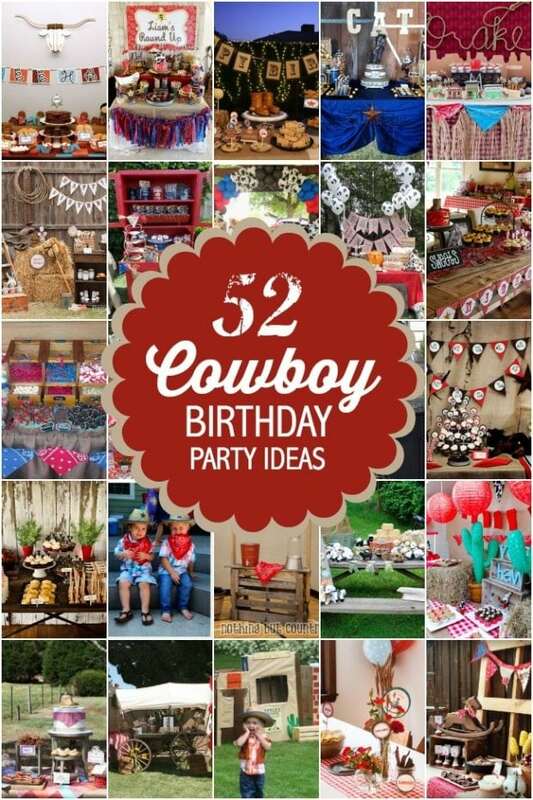 Corral your favorite party ideas from this cowboy birthday party. Natasha proved there’s no better place for a cowboy themed birthday party than outside in the backyard, in the open air—a perfect place for the party’s cowboys and cowgirls to eat birthday cake and wet their whistles. The cowboy theme party is also a great excuse for costume dress up. Guests donned provided bandanas and cowboy hats, ready to saddle up and journey into the Wild Wild West! Natasha’s DIY party decorations would be easy to make at home, and they add so much fun to the setting! A cardboard cactus comes to life with green paint and prickles made of spaghetti (so clever!). The “Beware of Poisonous Cactus” sign and a rope coil finish off the creative party prop. 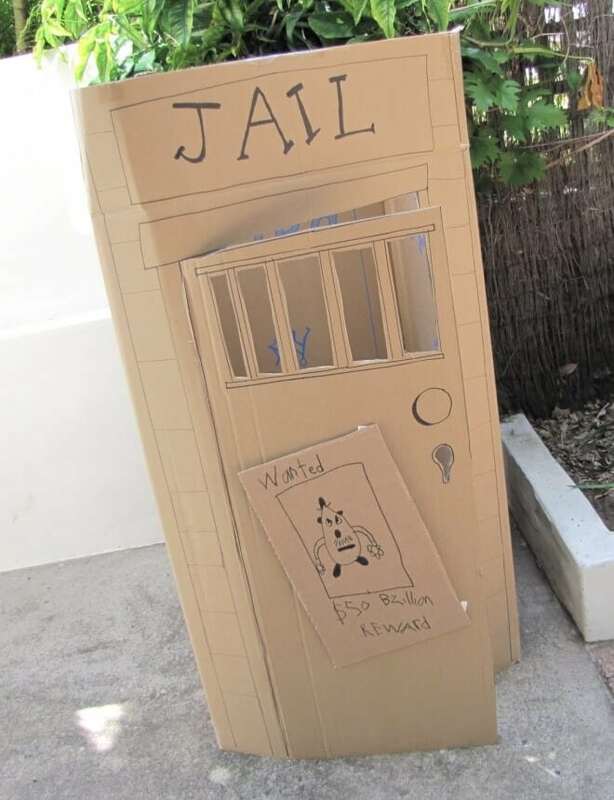 A sheriff’s office with swinging doors and a jail cell with barred windows are made from refrigerator-sized cardboard boxes and black marker. There’s also an awesome cardboard hitching post for “horse parking”. A variety of play horses decorate the space, and bales of straw are used as soft seating throughout the backyard. Natasha fashioned a teepee from leftover fabric scraps, rope and bamboo. You know the kids loved it too! The color scheme appropriately pays homage to a dry and sandy western town. A brown paper runner and framed lunch menu decorate the food station, and cowboy-friendly foil pie dishes are used as plates. A burlap flag banner hangs above and spells out the birthday boy’s name. A white tablecloth adds to the neutral color scheme, while a red burlap table runner adds a bright pop of color. Personal-sized quiche and star fruit sticks were especially popular with younger ranch hands but the menu also included cowboy favorites like sticky pork ribs, roast beef on baguette toast, and flatbread roll-ups. Mini waffle cones that wouldn’t mind the sun were filled with cookie cake balls and covered in white chocolate, to the delight of little guests. 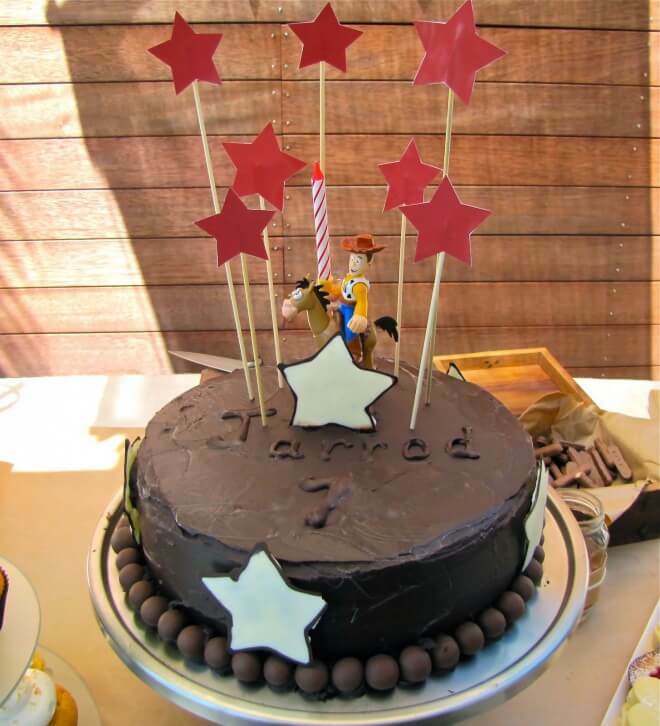 A white chocolate mud birthday cake decorated with Maltesers and topped with everyone’s favorite sheriff, Woody from Toy Story, wasn’t the only sweet treat. There were lemon curd cupcakes with Italian meringue, wagon wheels, strawberry Jell-O cups, fondant topped star cookies, and cookies and cream ice cream with mini Oreos. No cowboy birthday party is complete without a few “WANTED” signs, which was also a great party activity for kids. Each cowboy/girl got to play sheriff by creating their own portrait of a cowhand wanted for not cleaning the horse stables or their room. 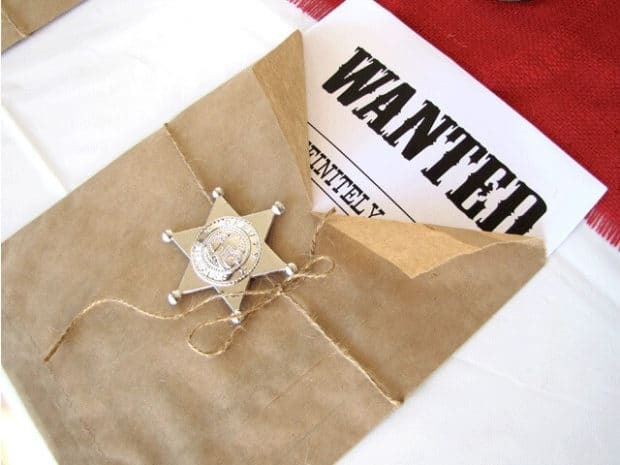 Each Wanted poster printout from Bookmaking with kids is concealed in a parchment paper bag and comes with a shiny sheriff’s badge. Yee Haw! In addition to the popular play structures, there were lots of activities to keep the party galloping: square dancing, musical chairs, pass Mr. Potato Head, darts (with kid-friendly magnetized darts), lasso games, and The Claw. Based on Toy Story’s mechanical game, this party’s cardboard and cellophane version was very popular. Kids used a toy claw to grab for a prize. Natasha sure knows how to throw a party! If you’re as enamored of her creativity as I am, you’ll want to check out her previous dinosaur party and vintage plane party that we’ve also featured.